Welcome to my own personal rant... er annoyance. Since this is my own personal blog, I'll keep it "constructive". You see, I don't like it either when people get shouty. However, whenever I encounter this sort of thing, I want to find the person or people responsible, grasp them by the shirt collars and start screaming at them. Usually from six inches away from their nose. What is this thing? It's a "Fancybox". It's also called a "Lightbox". Yes, seriously, that is what they're called. I'm not making this up. It looks like this picture below. Don't think I'm "Hating On" yugster.com, they aren't the only ones out there with this kind of laziness. The idea in this case, and many others is to get the person to sign in to their website. Ok, sure, for a couple pennies off the inflated price of whatever you're hawking, I'll sign in. 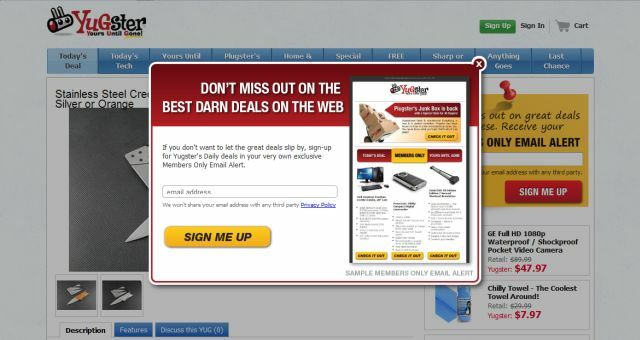 In the specific case of Yugster, their marketing is a "Deal A Day" site that grew a bit to include a few limited items. Great! They're usually at a good price, and I do check them out every day. What this site, and very many others, are doing is getting you to log in. They then leave a cookie on your machine saying Hey! Here's Bill again, lets change what's going on just for him and then present the page without the fancybox next time. Why? Cookies are a security problem. One of the first things I do when I set up a computer for myself or others is to explain this, then go into custom settings. Turn off third party cookies. Immediately. Then I set the browser up to delete all cookies when I close the browser. The second one is important. Sure, it's convenient to have your browser remember you and your signon, but what about your banks for example. Most banks do not do this, although Chase does seem to depend on cookies for some strange reason. Here's the deal. You sign on to their website, it places a cookie on your laptop. You go on about your business blissful in knowing that These People Remember Me! Yay, I'm warm and loved in happy cyber land! Now I go out to The Mall. I want my laptop since my partner intends to go shoe shopping and I already bought all the shoes I need on deep discount via the web months ago and they're taking up space in my closet behind the dog crate. I'm sitting in the food court with my shiny laptop and get hungry. Getting up, I walk over to the Chinese place and decide that I need some Gung Po Chicken and a large diet iced tea. Turn around and a shadow passes through my peripheral vision. Going back to the table, I notice my laptop is gone. Now, some people don't have a laptop with a password, or are so dumb that they made the password "1234" or "qwerty" or some such simple crap. That nefarious character has your laptop, got in, and is now snooping around your favorites. Finds your bank and bang, he's in. All because of a fancybox. Yes, It's a flight of fancy, but it illustrates a point. The idea that you can expect to keep those cookies intact is a truly bad one. It doesn't have to be a laptop, your big beefy dinosaur of a desktop machine will be one of the first things to go when your house gets broken into. Still feeling good about that warm plate of cookies and your fancyboxes? 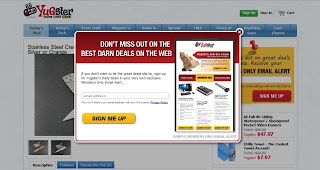 It isn't so much that these websites believe that everyone must stop and log into their sites, its that once you do that, they expect you to want instant access to their site, always. So if you don't want to be lined up against a wall and told how nasty your website is, leave the fancyboxes and lightboxes off. They're a bad idea.